Should Takiyah Thompson be charged for removing ‘white supremacy’ confederate statue? Home Scandal and Gossip Should Takiyah Thompson be charged for removing ‘white supremacy’ confederate statue? 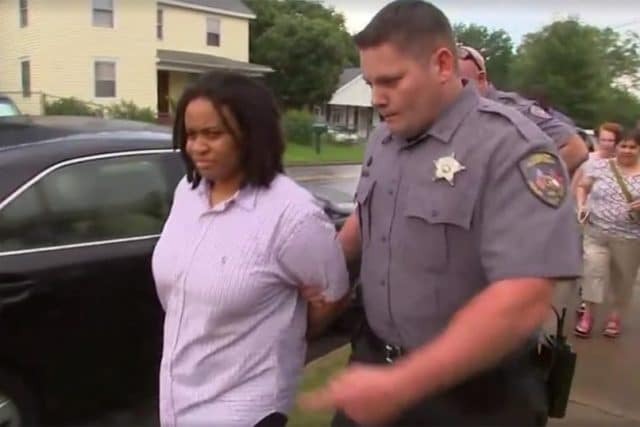 Pictured Takiyah Thompson who was arrested after participating in the toppling of a confederate statue in Durham, North Carolina. Should Takiyah Thompson be charged for removing North Carolina confederate statue? Debate over removal of statues along ideological lines intensifies. Takiyah Fatima Thompson a 22 year African American woman has been arrested after participating in the removal of a Confederate statue. Upon her arrest the woman who’d been part of a group of protesters that toppled the statue Monday night, said she did so because the statue represented ‘white supremacy’. Video of the toppling showed Thompson climbing a ladder and attached a rope around the statue. From there, demonstrators on the ground used the rope to pull the bronze Confederate soldier from its pedestal as a crowd cheered. Upon the statue falling, protesters began kicking the statue, while others took photos standing or sitting on it. Law enforcement officials who filmed the ‘incident’ chose not to intervene. WRAL-TV reported Thompson being taken into custody on Tuesday by Durham County sheriff’s deputies shortly after protesters held a news conference at North Carolina Central University. 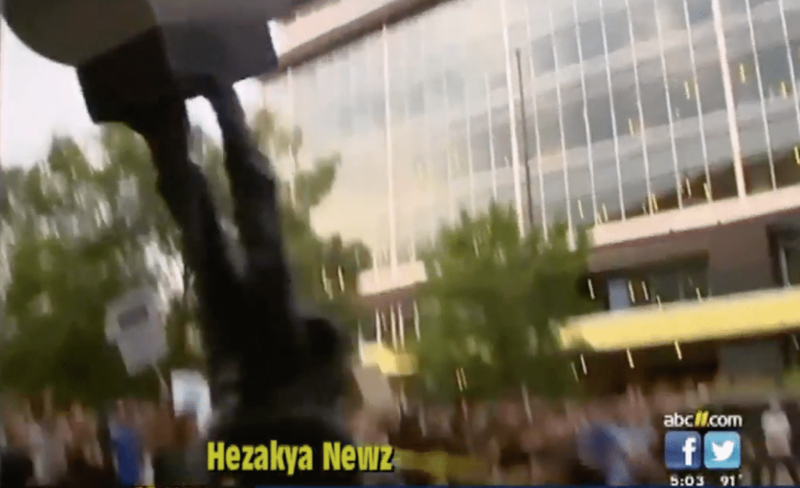 At the time, Thompson identified herself as the individual who’d climbed the statue and tied a rope around it while demonstrators toppled it to the ground. Upon her arrest, Thompson was charged with disorderly conduct by injury to a statue, damage to real property, participation in a riot with property damage in excess of $1,500 and inciting others to riot where there is property damage in excess of $1,500. The incident has since led to protesters demanding that all charges against Thompson be dropped. ‘The people decided to take matters into our own hands and remove the statue,’ Thompson, a member of the far-left Workers World Party and a student at N.C. Central University, said before being arrested. The incident led to Sheriff Mike Andrews saying protesters who toppled the nearly century-old Confederate statue in front of a North Carolina government building would face felony charges. The Confederate Soldiers Monument, dedicated in 1924, stood in front of an old courthouse that how houses local government offices. The crumpled and dented bronze figure has been taken to a warehouse for storage. The incident in Durham on Monday comes in response to the violent clashes that erupted at a rally by white nationalists over the weekend who were protesting the pending removal of a statue of Robert E. Lee in Charlottesville, Virginia. Monday’s incident led to Democrat governor Roy Cooper saying Confederate monuments ‘should come down’ with Cooper seeking legislature to repeal a law preventing state and local governments from removing them permanently and limiting their relocation. North Carolina is one of only three states – along with Virginia and Georgia – that have 90 or more Confederate monuments, according to the Southern Poverty Law Center. A state tally shows at least 120 Civil War monuments around North Carolina, with the vast majority dedicated to the Confederacy. Around 50 are located at contemporary or historic courthouses. The Republican-controlled legislature would have to repeal the 2015 law restricting the removal of monuments. Recent mayhem has since led to cities and states accelerating plans to remove Confederate monuments from public property as legislators plan to wipe away much of the remaining Old South imagery. Only two statues were taken down immediately, in Gainesville, Florida, where the Daughters of the Confederacy removed a statue of a Confederate soldier known as ‘Ole Joe,’ and in Durham, North Carolina, where protesters used a rope to pull down that Confederate monument. But the anti-Confederate momentum seemed to ensure that other memorials would come down soon. Many local and state governments announced that they would remove statues and other imagery from public land, or consider doing so, in the aftermath of Saturday’s white nationalist rally that killed one person and injured dozens more. Also siding with white nationalists and right wing fringe groups seeking to preserve the confederate statues was President Donald Trump. The quest to remove Confederate statues continues to keep the country divided along ideological lines, with alt right movements and white nationalist groups decrying the denouement of their status as ‘whites’ while purported leftist groups taking ‘matters’ into their own hands to see their kind of justice prevail. Which raises the awkward question, define justice and does one really expect the removal of statues to ameliorate the ongoing discontent and polarization between different members of society? Or to be more blunt, how did a purported race divide issue come to reflect the fissure what ought to really (and historically has always been) a discussion about class and capital divide…. ?